According to Reuters, more than 750 climate change activists have been arrested over the last six days in London. 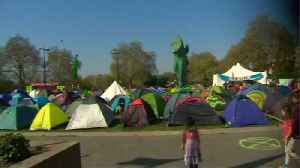 Police in the British city said the number was up Saturday from Friday's total of 682.. 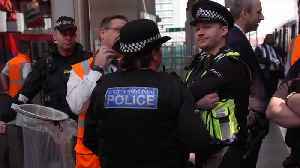 Specialist police teams used cutting tools to remove Extinction Rebellion climate change protesters locked on to the big pink boat road blockade on Oxford Circus in London on Friday. 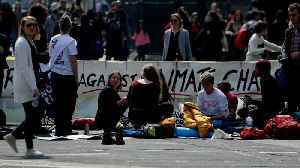 According to Reuters, police said that more than 700 climate change activists blocking roads at some of London’s most famous landmarks have been arrested over the last six days. The protests,.. 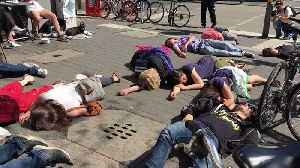 Climate change protesters staged “die-ins” at several locations in Cologne, Germany, on April 20, as part of ongoing Extinction Rebellion-planned demonstrations worldwide. 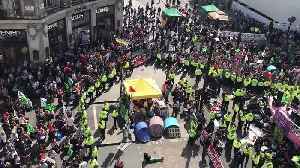 In the UK, Extinction..
Police formed a heavy presence on the afternoon of Saturday, April 20, at London’s Oxford Circus where Extinction Rebellion climate-action demonstrators were camped out for a sixth day of.. 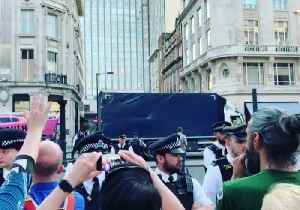 Authorities in London removed a pink sailboat on April 19 that had been parked at Oxford Circus during a climate change protest organized by the Extinction Rebellion group. 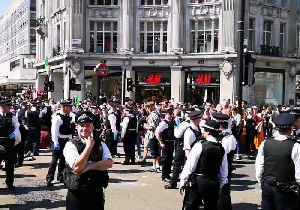 Protesters attached..
Members of London’s Metropolitan Police stood hand-in-hand to cordon off demonstrators at Oxford Circus on Friday, April 19, stopping more people from joining a climate change protest. The Extinction..